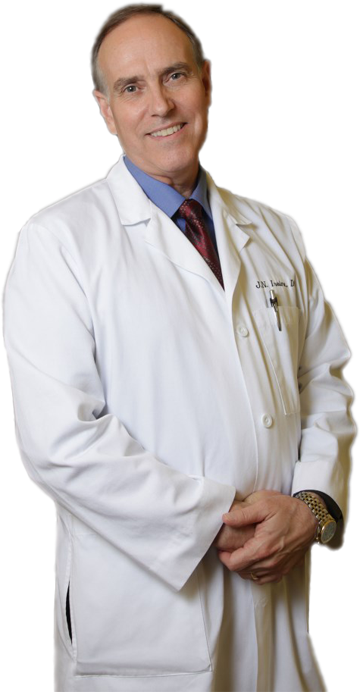 Dr. James Irvine graduated from the University of North Texas Health Science Center, Texas College of Osteopathic Medicine in May 1989. His postgraduate training was done in San Diego, CA and he is board certified in Family Practice. Dr. Irvine is a native Texan and while he enjoyed living and practicing medicine in California, his love for family is greater and he returned to Fort Worth in 1993. Born and raised in Wichita Falls, he initially moved to the Metroplex to complete his undergraduate education from the University of Texas at Arlington. While there, he assisted in groundbreaking research in the embryology lab with Dr. Phillips. In addition he also worked part time at Southwestern Medical School in Dallas in the anatomy department assisting with research. Dr. Irvine enjoys Family Practice and his scope of practice includes family medicine, laceration repair, DOT physicals and FAA physicals for pilots. As he has been taught by Osteopathic principles, Dr. Irvine treats each patient as a whole person. He is open-minded toward the use of herbs, vitamins as an adjunct to medical treatment. Dr. Irvine is a teacher by nature, he not only educates his patients, but he at times is a preceptor for medical students in their clinical training. Dr. Irvine has been a member of Southcliff church in Fort Worth for twenty years. He leads a small group on Sunday mornings. Dr. James Irvine is married to Dr. Sharon Irvine and has three children. His oldest, Dr. LaPonna Moore, is a family practice doctor in Fort Worth. His younger daughter, Moriah Kerr, is a nurse practitioner with Mansfield Medical Clinic. His son James is software engineer with American Airlines. Dr. Sharon Mansfield Irvine graduated from the University of North Texas Health Science Center, Texas College of Osteopathic Medicine in Fort Worth, TX in 1988. Having grown up in California, she went to San Diego for her postgraduate training and stayed for five years before returning to the Fort Worth area. She is Board Certified in Family Practice with an emphasis in women’s health and bio-identical hormones. The ability to heal and maintain health is affected by the mind, body and spirit. This is one of the basic tenets of Osteopathic Medicine and over 18 years ago Dr. Irvine began investigating hormone levels, vitamins and other nutrients and their physiologic importance in the healing process. She uses saliva and blood testing to evaluate and quantify the need for estradiol, progesterone, DHEA, testosterone as well as adrenal and thyroid function. Dr. Irvine is familiar with several compounding pharmacies in the area that are available to provide these natural products. Dr. Irvine has been a member of Southcliff church in Fort Worth for twenty years. She leads a small group on Sunday mornings. Dr. Sharon Irvine is married to Dr. James Irvine, and they have three children: LaPonna, Moriah, and James. Dr. LaPonna Moore, is a family practice doctor in Fort Worth. Moriah Kerr, is a nurse practitioner with Mansfield Medical Clinic. Her son James is software engineer with American Airlines. Shannon grew up in Abilene, Texas. She attended Abilene Christian University and graduated with a Bachelor of Science degree in nursing in 2009. She relocated to the Fort Worth area and worked as a Registered Nurse at Plaza Medical Center in the cardiology department. Shannon later was employed at Fort Worth Surgery Center while attending the University of Texas at Arlington. She graduated with her Master of Science degree in Nursing and is certified as a Family Nurse Practitioner. She loves seeing patients of all ages, including children. Shannon married Alan Dezonia and has two children. Most of all, she loves Jesus and wants to glorify Him in all she does. She and her husband Alan live in North Richland Hills, Texas and they attend the Hills Church in North Richland Hills, Texas. Moriah Irvine Kerr grew up in Abilene, Texas. She graduated from Hardin-Simmons University with a Bachelor of Science in nursing in 2008. While in school she was a tech in the intensive care unit. Post-graduation she relocated to the Fort Worth area to be closer to family. She worked as a Registered Nurse at Plaza Medical Center in the Neurological and Surgical Intensive Care Units. She was later employed at the Fort Worth Surgery Center while attending graduate school at the University of Texas at Arlington. During that time she is became member of the Sigma Theta Tau Honor Society of Nursing, and was recognized with an Excellence in Clinical Practice. Moriah graduated with her Master of Science in Nursing in 2013 and is certified as a Family Nurse Practitioner. She graduated at the top of her class. Moriah loves treating patients from the very young to the elderly. She has a particular interest in women’s health and thoroughly enjoys educating patients especially regarding preventative care. Moriah met her husband Ryan at church, and they married in 2011. Their family has now expanded as their son, Luke, was born in January of 2013 and daughter Ellie born February 18, 2016. Moriah and her family currently live in Fort Worth. The Kerr’s enjoy the outdoors, spending time with friends and family and playing games. Rebecca Bartmas grew up primarily in South America and Long Island, NY. She pursued her Bachelors of Science in Nursing at the University of Texas at Arlington and graduated in 2010. She then worked as a registered nurse at Methodist Dallas Medical Center in the emergency room for five years. To further her knowledge she pursued graduate studies again at University of Texas at Arlington where she graduated with her degree and became a certified Family Nurse Practitioner. She has worked as a nurse practitioner in pediatrics and loves using her Spanish. Rebecca has lived in the Mansfield area for about ten years. She attends Eden Road Community Church where her and her family seek to know Christ more and share His love with others. Her and her husband met at ERCC while serving the youth group there. They have on little girl named Eliana. Rebecca and her husband also both love playing soccer.